Today we continue our discussion on how to deal with rule versioning and rule history in a declarative way. In our first column on this topic we described the characteristics of the rule history and versioning problem, and we discussed an example and a simple solution. In our second column on this topic we discussed an efficient and declarative solution that can be used when rules are versioned on a small number of dates (for example every year on the first of January). 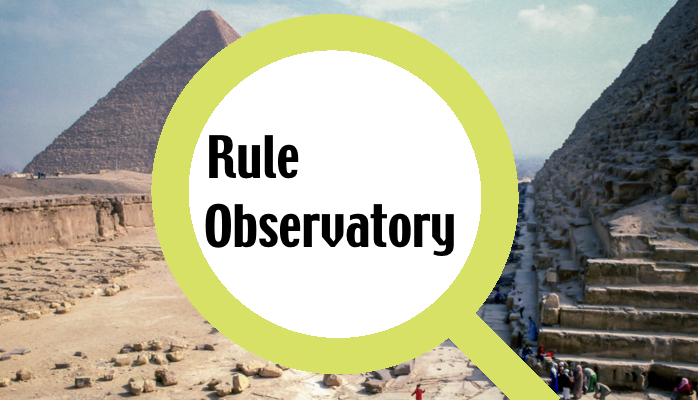 Today we will discuss a strategy for dealing with rule versions that is efficient and works if there are lots of different new versions of rules. Some rule engines have implemented a strategy like this as basic functionality in their environment. For complex rule versioning it is recommended to see a rule as an object with attributes (meta information) and to create an object for each rule. This allows one to specify extra information about a rule in your object model, use inheritance to propagate certain properties of rules to a wider range of rules, and do selections of rules based on that information. The Attributes marked with * are not necessary to solve the rule versioning and history problem. They are listed to give hints for further improvements of the performance of posting rules or depend on the functionality of the rules. The Rule Class should have a method “RuleStatement” in which the actual rule is stated or referenced. For each rule in the application, a subclass of the RuleClass should be created. In this class the class attributes StartDate, EndDate, and RuleStatement get a value. After the forward chaining statement, the applicable rules are posted and the task inference can start, in this example with a backwardchain statement on premium. The complexity of the reasoning task in the applicable rules. If this complexity is higher, it is expected that the gain is greater. The solution, though, will not guarantee to give the necessary performance win. However, the solution gives many more possibilities for increasing the performance when it is not good enough. The strength of this solution is that it is scalable. For example, the programmer can work with hash tables or database queries to select the rules that must be evaluated. This is the main difference with solution 2. A disadvantage of this approach is that you cannot use verification technology to see if there are rules that express the same logic and have overlapping applicability periods. Verification will be more difficult, in general. Create tables or classes that allow you to store meta information for each rule, and create a selection algorithm (eventually rules based) to select only the applicable rules. Use this solution when a very large subset of the rules is subject to versioning and the applicability period of individual rules is different for all these rules.